Enjoying a Mediterranean climate, the family-run Hotel Pia Bella in Kyrenia is an ideal spot for a relaxing festive holiday! There’s plenty of history, nature and culture to discover here too; set amid spacious, tranquil gardens, our hotel is just a brief walk from the historic harbour and its wide range of shops, bars and restaurants. Read our blog to find out the top things to do in North Cyprus! 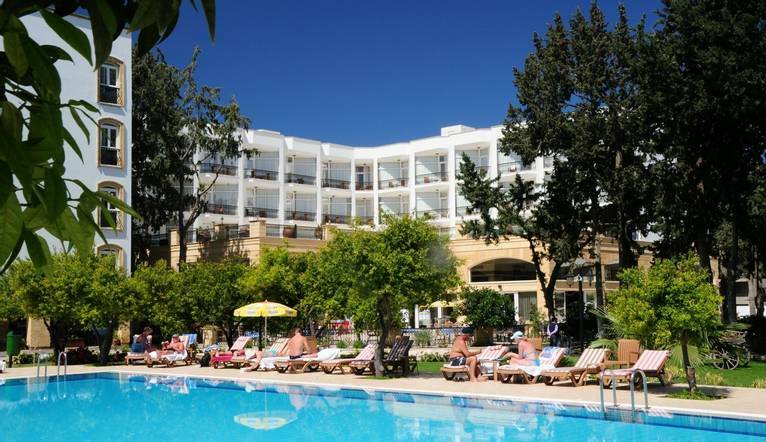 Hotel Pia Bella is a small, friendly and welcoming hotel, with a relaxed atmosphere due to its rare authentic charm, hospitality, comfortable design and prime location right near the centre of bustling Kyrenia. It is a 10 minute walk to Kyrenia Harbour, Kyrenia Castle and several shops, restaurants and the seafront are nearby. A stay at the Pia Bella hotel in Kyrenia ensures a pleasant holiday that will provide you with everything you need over the festive period. Sandwiched between the sea and the Five Fingers mountain range, the town of Kyrenia can trace back its DNA some 6,000 years. Today, terraced cafés, boutiques and local markets stacked with the local catch fight for your attention alongside boats bobbing on the water and the ancient castle. A quiet place to enjoy a cooling beer by day, the harbour livens up as the sun shuffles over the horizon. There is also a choice of late night bars along the seafront that play a variety of music to suit every preference. By day, the fairy-tale castle of St. Hilarion, which is said to have inspired 'Sleeping Beauty', invites us to explore. Venture slightly out of town and you can also discover the charms of Bellapais village with its picturesque monastery on top of the hill. Dining here is a delight, and not just because of the views. Before you get to stand your teaspoon in a cup of Turkish coffee, open with a meze of Turkish Cypriot teasers. If you fancy treating your taste-buds even further, try kebabs straight from the clay oven or fresh sea bass off the barbeque. Our hotel is located in central Kyrenia within walking distance to some of the shops, restaurants and attractions that Kyrenia has to offer. Our hotel houses two outdoor swimming pools, one with a pool bar, and four dining options: the main dining restaurant and the terrace, The Annex and The Mezzanine a ‘la carte restaurant. A laundry service is available (payable locally) and free WiFi can be accessed in all public areas of the hotel. Our rooms come with air-conditioning (hot and cold), tea and coffee-making facilities, a mini-bar and electronic safe box (payable locally), a satellite TV and a balcony with town-facing views. Transfer time from Larnaca airport to Pia Bella is approximately 90 minutes.